In our previous article on marketing automation, we talked about how to create campaign categories and campaign “containers”. Today we address a second part, where we will specify the different actions and events which can be included in a campaign and how to measure them. For example, in a seasonal campaign with a promotional offer, we can do email, online advertising, at the point of sale, SMS, etc. Each of the actions will have its own cost, target audience -clients and non-clients-, metrics… so it is advisable to differentiate the actions in order to obtain ROI information or determine which channel works best. We use the “Events” tab when a marketing campaign has different actions and/or channels. Depending on the type of action, tracking will be done in the sub-tabs of Email, Direct Mail or Other Events. You can schedule the date and time of the launch of a campaign and tracking. SEM campaigns are treated differently, which we will discuss in another article. The tracking of different actions for different channels is done in the events tab, each is done separately. A user with Administrator permission can create new channels by accessing: Setup> Sales and Marketing Automation Campaign Channels> New. Not Started – For actions that are in their early stages. Planning – Indicates that the action is being prepared and is not yet complete. Execute – Marks the start of the action on the selected date and time. In the case of email campaigns, it will indicate the date and time sending of the campaigns will be activated. Sent – Indicates that the campaign has been activated. 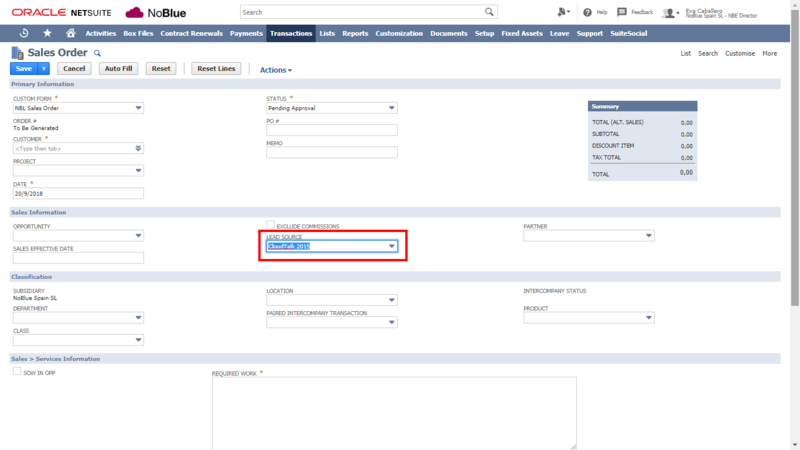 In the case of emailing it means that the sending has been completed and the status change is automatic once NetSuite carries out the sending. Failed – Error. Indicates that the emailing has not been sent. It could indicate that the maximum number of monthly sends has been exceeded. Other reasons may be errors in the email addresses or the recipient’s servers. Once the different actions/events have been created, the campaign can be executed. Edit the campaign you want to launch. In the Events tab select the event. In the Status column, select Execute. Mark the start date and time. Attention, if you try to make a change on the same day that the start is scheduled, the system will not allow it. 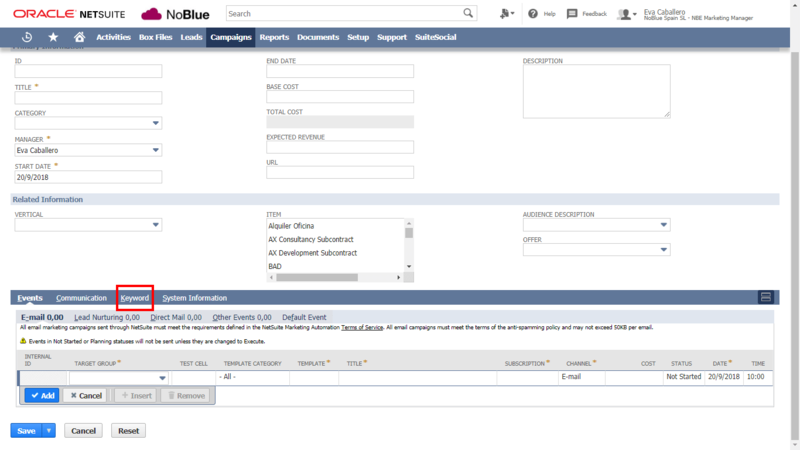 In the case of email campaigns, once sent, you will receive a notification indicating that the action has been executed and the status will automatically change to Sent. The campaign actions are individual. For example, a campaign may include different actions: print ads, email to customer database and an online banner. 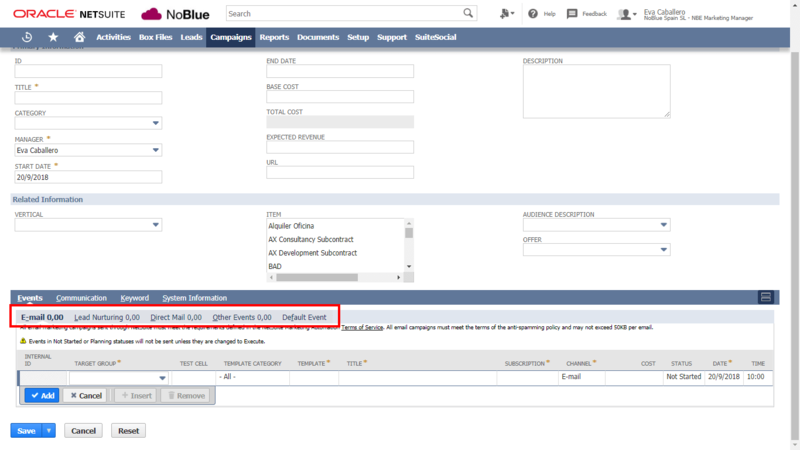 Select the Events tab within the specific campaign. Choose the Channel for this action. Remember that we have said that there are 5 channels by default, but you can customize and add others. In the Public (Target Group) column, select the target audience. Select a Title for this action. The Subscription column is the one that guarantees that you are complying with the GDPR. Do not forget to select only the users who have authorized you to send marketing campaigns. In the Channel column, choose the appropriate one for this action. Set the cost of the specific action. We already commented in our previous article that the individual costs of the actions will be added in the Total Cost field of the “campaign file”, in the “Main Information” section. In my case, the costs of creativity are included in the section “Base Cost”, and the adaptations according to the action are included in the cost of the same. 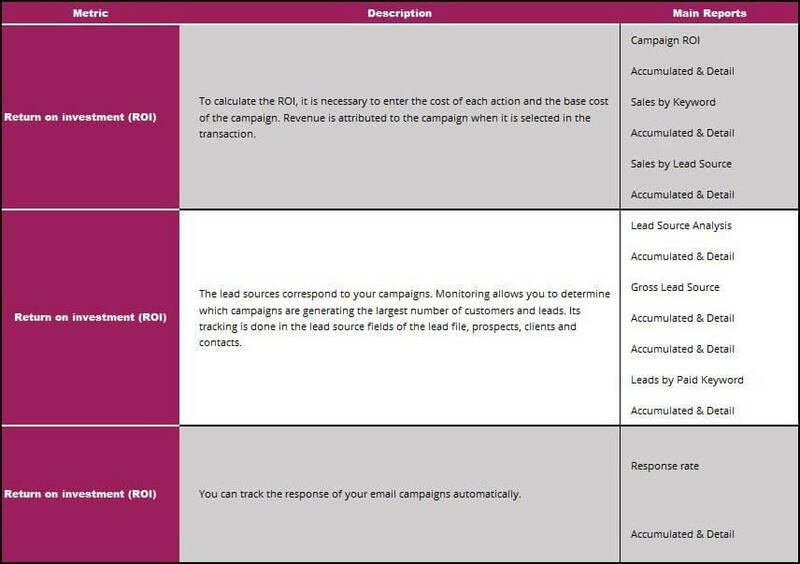 By entering the cost of the campaign you can measure the return (ROI) of both the action and the campaign. Select the Status – we have already discussed the differences. Leave the Internal ID field empty. When saving the campaign, a number will be assigned automatically. This identifier will allow you to track the response. Repeat these steps for all the actions you want to schedule within the campaign. 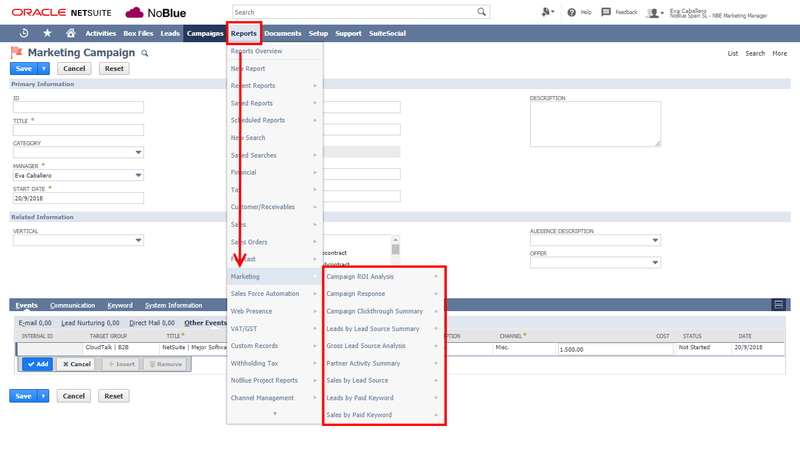 The metrics that NetSuite offers by default are multiples, allowing analysing the effectiveness of the campaigns both based on lead generation and its transformation into sales, but you can define your own reports based on the KPI you want to control. You can access the reports in the Marketing section under the heading Reports. 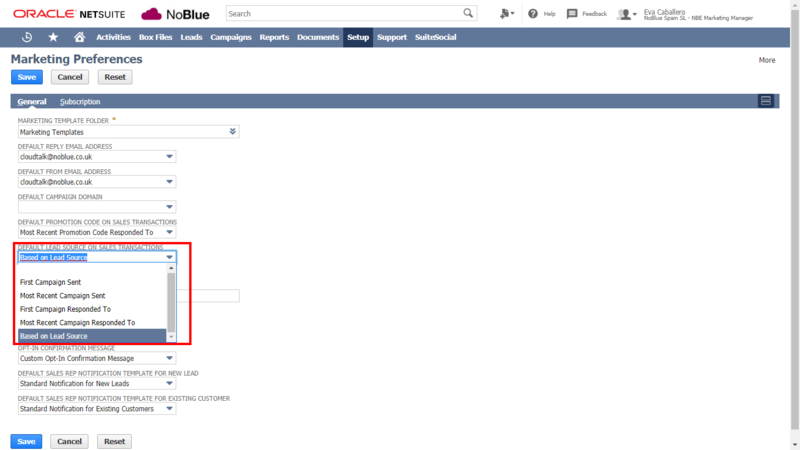 When you select or assign a campaign in the Lead Source field in a transaction, your revenue is linked to the campaign. For leads and commercial transactions manually loaded into the System, I recommend that you establish a default Source. Go to Setup> Sales & Marketing Automation> Set Up Marketing. First Campaign Sent – Select the first campaign that was sent to the client. Most Recent Campaign – Select by default the last marketing action received by the client. First Campaign which has responded– The first campaign that triggered customer feedback. Most Recent Campaign which has Responded– The latest action with feedback. Based on the Source – The Source that has generated the lead. By default, the System is assigned its classification by the source of the lead. All activity that is generated online will automatically assign the source. In the case where a lead enters through another channel, such as the telephone, it will be necessary to assign the source manually when the new contact record is created. The Return on Investment (ROI) is calculated by the difference between the cost of the campaign and the income it generates. When the campaign is created it is necessary to enter the Base Cost. If the campaign consists of different actions, the cost of the individual actions will add up in the Total Cost field. Once the orders are generated, sales revenue will be linked to the campaign. ROI divides revenue between cost.